As you may know, having a thick insulation is necessary for any building as its purpose is to reduce incoming noise from outside sources. It is also important as it can maintain a stable temperature inside your structure. There are different types of insulation available from a spray foam roofing, but a professional foam roofer like 1st Class Foam Roofing & Coating in Arizona has the expertise required to find out what is the best type of insulation for your new foam roofing. In this blog post, we will explain some information of R-Value in Spray Foam Roofing. Remember that with proper maintenance, a new foam roofing installation in Phoenix can last for almost a lifetime. WHAT DOES R-VALUE MEANS IN SPRAY FOAM ROOFING? R-value in spray foam roofing in Phoenix is the term given to the thermal resistance against the flow of heat; the higher the R-value is in your insulation, the lower the rate of heat will be. To find the R-value of your spray foam roofing, you need to take into consideration the material of your roofing, mass, appliance, and thickness. Since this regulates the flow of the heat inside your structure, it can translate into saving money in air conditioning, up to 40%, depending on the R-value and the type of insulation you acquire. 1st Class Foam Roofing & Coating is always available to remove any doubt you have with just a quick call. WHAT TYPES OF SPRAY FOAM ROOFING INSULATIONS CAN I GET? On the spray foam market, there are two types of insulations available: open cell insulation and closed cell insulations. As a quick note, no option is better than the other one because they cover different roles and functions. In any case, compared to traditional insulation from various materials, the insulation from spray foam has a considerable larger amount of R-Value. 1st Class Foam Roofing & Coating guarantees consistency as the spray foam insulation is prepared and installed on the roof we work on, so there is not a chance to lose R-Value for your property. To ease your curiosity, we will explain the main difference between open cell insulation and closed cell insulation. Open cell insulation foam can absorb and hold water while being vapor permeable. The R-value of open cell insulation is lower per inch compared to the closed cell one, but it will not decay on great spaces. Closed cell insulation has better density and gluelike tenacity that adds structural strength to your roof assembly. This insulation has a high R-Value per inch than its counterpart, but it decays in significant areas. Both are made from polyurethane, so a new foam roofing is capable of reducing air leakage better than other roofing materials. Another advantage is that spray foam roofing can be installed in any roof without worrying about any unusual shape or cavity on it. Spray foam roofing can be applied to everything. WHAT IS THE PRICE OF SPRAY FOAM INSULATION? The value of the insulation in spray foam roofing changes depending on the geographical location, based on their local market. So far, the R-Value for spray foam insulation in Phoenix remains higher than other types of insulation from different materials, and it keeps its market value since it does not degrade with the pass of time. With proper maintenance, the composition of Spray foam roofing has the characteristic of lasting indefinitely since the first day of installation. Spray foam insulation can be a short-term investment, but it will be cost-effective in the long run since the value won’t decrease over time. With over a decade of experience in residential and Phoenix commercial foam roofing, 1st Class Foam Roofing And Coating’s owner Jason Rivers decided to follow his passion in providing the best spray foam roofing service in the market at the most affordable price. 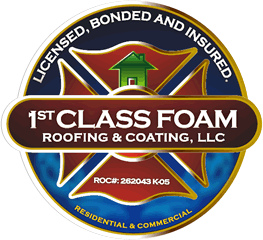 With SPFA Certified Applicators with several years of experience, 1st Class Foam Roofing And Coating is an established foam roofing, insulation, and coating company that promises high quality in every inch on your roof. We work hard towards excelling our customer’s needs and concerns. Don’t hesitate to give us a call at (602) 722-0663 if you have any questions about our services. You can also contact us for a free roof evaluation without any obligation.